Plans to mine lithium – the key metal used to manufacture smartphone batteries – less than 3km from the centre of the Spanish city of Cáceres have been met with huge public opposition. Spanish mining company Sacyr and the Australian mining giant Plymouth Minerals want to mine for the metal in Valdeflores – the site of a former mine that closed in the 1980s which has since become a wildlife haven. The area has been designated as a Special Protection Area (ARA) under the EU’s network of protected nature sites. 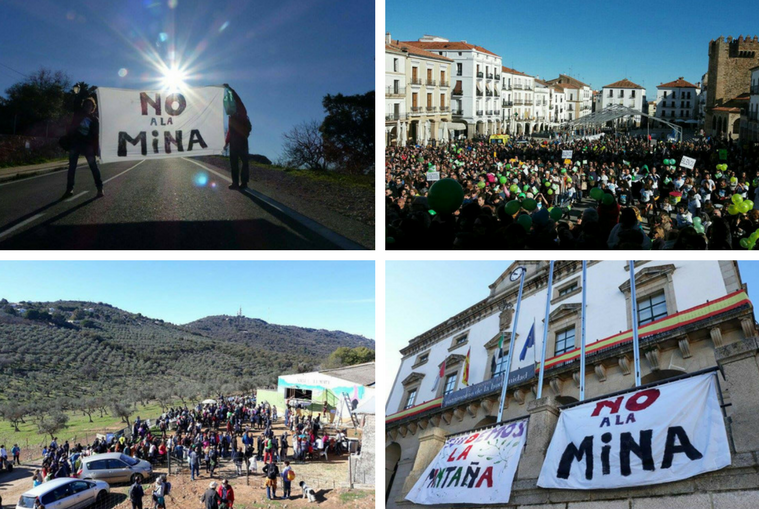 In reaction to the plans, local residents launched the Save the Cáceres Mountain campaign. The latest demonstration took place on 3 February. With the number of opencast mining licences issued in Spain skyrocketing in the last 5 years, environmental campaigners fear a Spanish mining “boom”. Other projects pending approval include plans for mining copper in the low Guadalquivir river basin, gold in Galicia and Asturias, uranium in Salamanca, titanium in Ciudad Real, potash in Navarra and Aragón, feldspar in Avila, and rare earth in the Canary Islands. Samuel Martín-Sosa from campaign group Ecologistas en Acción warned that mining has devastating impacts on air and water pollution, and can lead to chemical and radioactive contamination. Back in 2008 the European Commission launched an initiative on securing “sustainable access” to raw material resources within the EU and commitments and rules differ from one EU country to another. In December 2017, the regional government of Castilla-La Mancha formally denied Quantum Mining Company’s request to start a rare earth mining project in Campo de Montiel (Ciudad Real). This follows on from a previous high profile case in 2014 when the Castilla y León regional government scrapped plans for mountaintop removal coal mining – an explosive industrial extraction process – in the Laciana Valley – an area protected by EU environmental legislation. Beyond the surge in demand for metals in electronics, the current spike in mining activity has also been partly linked to the shift from fossil fuels to renewables and the resulting need for massive amounts of metals and minerals to replace existing infrastructure and technology based on oil, natural gas and coal. Recent research has also revealed a direct link between the growth in mining exports and the growth in environmental conflicts across Colombia, Ecuador, Peru and Bolivia.